The Iran deal orchestrated by Barack Obama when he was president, by various estimates, might have cost the U.S. more than $33 billion in cash and gold. And possibly its grip on the rogue nation’s potential for developing nuclear power. Now there’s a new report that Obama also gave up something that literally cannot be purchased with money: thousands of citizenships to Iranians. Fox News is reporting the claim comes from Hojjat al-Islam Mojtaba Zolnour, in a report quoted by the country’s Fars News agency. The estimated 2,500 citizenships to Iranians included members of the families of government officials. Zolnour is chairman of Iran’s parliamentary nuclear committee. He made the claims while being interviewed by Iran’s Etemad newspaper, cited by Fars. “He claimed it was done as a favor to senior Iranian officials linked to President Hassan Rouhani, and he alleged the move sparked a competition among Iranian officials over whose children would benefit from the scheme,” the report said. It was the Joint Comprehensive Plan of Action that Obama had Secretary of State John Kerry give to Iran. It’s the same plan that President Trump has condemned. He said the U.S. is pulling out. But back in the Obama era, the JCPOA was promoted and touted as the solution to the nuclear ambitions of Iran, which has vowed to wipe Israel off the map. The Iranian claimed, “When Obama, during the negotiations about the JCPOA, decided to do a favor to these men, he granted citizenship to 2,500 Iranians and some officials started a competition over whose children could be part of these 2,500 Iranians. “If today these Iranians get deported from America, it will become clear who is complicit and sells the national interest like he is selling candies to America. “It should be stated exactly which children of which authorities live in the United States and have received citizenship or residency,” he said in the interview. The State Department told Fox it was not going to comment. It was talk radio icon Rush Limbaugh who revealed weeks ago that the agreement never even was signed. 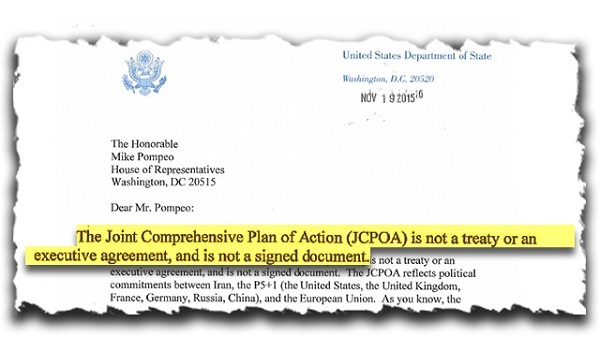 “The Joint Comprehensive Plan of Action (JCPOA) is not a treaty or an executive agreement, and is not a signed document. The JCPOA reflects political commitments between Iran, the P5+1 (the United States, the United Kingdom, France, Germany, Russia, China), and the European Union. As you know, the United States has a long-standing practice of addressing sensitive problems in negotiations that culminate in political commitments,” he said. “You realize the folly of this? Something that the Iranians didn’t sign, the Obama administration said that doesn’t matter! Whether they agree to it and abide by it is what matters. Why would they abide by it if they didn’t sign it?” he said. In the aftermath of the deal set up by Obama, reports revealed he may have gifted Iran an extra $33.6 billion in secret cash and gold payments between 2015 and 2016. A spokesman for the Foundation for Defense of Democracies, Mark Dubowitz, said Iran may have gotten as much as $33.6 billion in cash and gold. Read the full article at WND.